Excerpt from Centenary Anthology, Chapter Three: Srila Guru Maharaj Remembers. Every year in August we had to come back to the Calcutta Math celebration for one month. So when I came back here I was taken by Sripad Bhakti Hriday Bon Maharaj and Sri Hayagriva Prabhu [later Sripad Bhakti Dayita Madhav Maharaj] in a party towards Madras side, installing the footprints of Mahaprabhu. Then again upon returning, the Bagh Bazar Math was opened, and from the original rented house in Ulta Danga the Deities were moved in procession in a chariot to Bagh Bazar Math, and a one-month festival was held there. 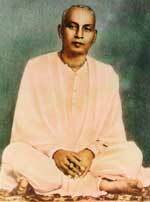 After that Prabhupad (Srila Bhaktisiddhanta Saraswati Thakur Prabhupad) went on that year establishing and installing those Pada-pith [footprints of Mahaprabhu] up to Mangalgiri, near Bejoyda, Kobhur, and so on. Then he went to Madras and declared the opening of Madras Gaudiya Math and put us there. We rented a house. Sripad Bon Maharaj was the leader and the senior sannyasi. In the meantime I was given sannyas, recommended by Sripad Bon Maharaj. He said about me, "He can preach well; he's a good preacher rather than a canvasser." I had a B.A., and I was known as Sri Ramendrasundar Bhattacharyya, B.A. My duty was to approach the people and introduce the sannyasis, and more or less I had the work of a canvasser. But Sripad Bon Maharaj said, "He's not a good canvasser but a good preacher. He can speak Hari-katha very well." Then I was given sannyas in October, 1930, and after installing footprints of Mahaprabhu one by one in various places, Prabhupad opened the math in Madras [as above mentioned], and we were left there and began preaching for three years or so. Then there was Vrindavan Parikrama, circumambulation of the whole of Vrindavan. We joined that programme, and then Sripad Bon Maharaj went to England for preaching, and I was in charge of the Madras Math. The temple was constructed almost in my time. Later, Bombay Math was opened, and I was again taken there. I lived there for some time, and later was taken with the general party with Prabhupad. Staying most of the time with Prabhupad, we preached in different places of Bengal. At 5.30 a.m. on 1st January, 1937, Prabhupad left the world. Myself [Tridandi-bhiksu Sri B.A. Sagar]: I heard that Srila Prabhupad praised you as 'Sastra-nipuna'. Srila Sridhar Maharaj: Oh. In Madras, in the 'Gaudiya', Gaudiya Math's leading weekly paper, there was published one siddhanta. The birthday of Srimati Vishnupriya Devi and the birthday of our Guru Maharaj were mistakenly transposed. Both are panchami [fifth lunar day]. Srimati Vishnupriya Devi's is on panchami of the bright moon fortnight, and Prabhupad's is on panchami of the dark moon fortnight. But they were transposed - Prabhupad to the bright fifth and Srimati Vishnupriya Devi to the dark fifth. I read it carefully, and I thought the basis of the philosophising was wrong. Why has Krishna-Shakti come on the bright moon, and Gaura-Shakti on the dark moon? I found it should be just the opposite. I showed it to Sripad Bon Maharaj, considering it a grave error. He suddenly took up the pen and wrote a letter to the effect, "What is this? We thought that the editors have some touch with the reality and what they write has some real connection with the sentiment, but how can this sort or error be possible from them? Have they no srauta-connection? All concoction!" So it was detected, and an amendment was published in a later issue. When Prabhupad was there, the books 'Ray Ramananda', 'Relative Worlds' and 'Brahma-samhita' were published. It was mentioned that when Mahaprabhu went to Vrindavan He met Sri Rupa and Sri Sanatan Goswamis on the way. But I knew it clearly that He met them when returning from Vrindavan, so I objected. Anyway, I didn't take it to Prabhupad's notice, but it must have come to his notice that Sridhar Maharaj detected all these things. On the occasion of his Vyasa-Puja, Prabhupad delivered a written address, and there he mentioned before my name, "Sastra-nipuna Sridhar Maharaj - he has very deep knowledge in the Scriptures"; that was his consideration. Excerpt from Affectionate Guidance, Chapter Eighteen: Message to Massage the Devotees' Hearts. Sripad Bon Maharaj was a friend of Sripad Goswami Maharaj, and he suggested to Goswami Maharaj, "Oh Goswami, you have spent your whole life preaching. Now you are old, so come and do some bhajans." Sripad Goswami Maharaj was very angry and thought: "What I am doing is not bhajan? What are you thinking? This is my bhajan. I am serving Krishna, serving Mahaprabhu and serving my Guru. This preaching is my bhajan but you think that to chant on beads in the jungle is bhajan." Though he thought this, Sripad Goswami simply replied in summary to Sripad Bon Maharaj, "I want to die in harness." Srila Guru Maharaj quoted this expression many times to me, and instructed me never to forget it: "I want to die in harness." Even the very last moment of our lifetime we shall not spend for any other purpose. We want to offer even that to our Gurudev. I am very happy to remember that, and whenever I am in very much difficulty I think that Krishna wants to take my blood, and He will not spare even the last drop of blood. And if it is His wish, He will take it.